Children from the Japanese Language School Unified System perform at Love to Nippon at LAPD Headquarters. On March 11, 2011, a catastrophic earthquake and tsunami devastated Japan’s northeastern region (Tohoku) and many other areas since, forever changing the lives of millions. The long and challenging road to recovery continues. Last March 10, Love to Nippon Project again encouraged Los Angeles citizens and members of local community organizations to share the importance of natural disaster preparation. 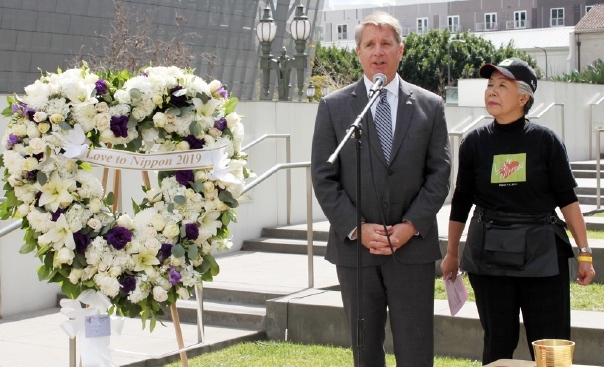 The theme for Love to Nippon 2019 was “Be Prepared, Los Angeles!” The day event was held at LAPD Headquarters, followed by an evening prayer at Santa Monica Pier North. To honor the memory of those who perished and to celebrate the resilient spirit of those rebuilding their lives, more than 350 participants came together as a community to pray, to remember, and to learn from the tragic experiences to help the community in the future. Janet LeBlanc and Lori Gardea, board members of Love to Nippon Project, served as emcees for the first part of the program. Outdoor displays included a Los Angeles County Fire Department fire truck, a Love to Nippon Project information desks, and booths staffed by the Fukushima, Miyagi, Iwate, Tochigi and Kumamoto kenjinkai (prefectural organizations) of Southern California, Japan National Tourism Organization (JNTO), and Japan Airlines. Dr. DoAnn T. Kaneko provided kata-tataki (shoulder massages). Masako Unoura-Tanaka, founder of Love to Nippon, and Doug Erber, president of Japan America Society of Southern California, offer words of appreciation. A taiko tribute was performed by members of UCLA Kyodo Taiko: Sophia Inaba, Kellie Lee, Minami Sasaki, Lindsay Masukawa, Kyle Nakahira, Bradley Nishida, Gianna Furumoto, Isaac Caldas, Jason Muljadi, Brandon Fujii, Kiana Shibata, Cade Okohira, Mattie Kao, Reilly Terao and Michael Tabe. A flamenco dance tribute by Mikaela Kai, Yoko Shibata and Mayumi Hayasaka followed. A second performance by Kyodo Taiko featured co-directors Lindsay Masukawa and Kyle Nakahira. Izumi Hasegawa, senior priest of Shusse Inari Shrine of America, conducted a Shinto ceremony. Members of Southern California Kendo Organization — Sharon Kumagai, Mai Mori, Koji Mori, Shigei Nakamura, Yujin Takayanagi, Sullivan Bryant, Katie Kamimoto and Kouji Kamimoto — gave a demonstration. Gardea, Toby Mallen of Nichibei Fujinkai and Kay Kayoko Inose and Kitty Sankey of Japanese Women’s Society of Southern California emceed the second part of the program. The national anthems of the U.S. and Japan were sung by Noi Maeshige. An interfaith service was conducted by Rev. Masaaki Shiraiwa of Union Church of Los Angeles and Rabbi Shalom Rubanowitz of Pacific Jewish Center (“The Shul on the Beach”) in Venice. Also participating were the Nikkei Interfaith Group of Little Tokyo and Los Angeles Buddhist Temple Federation, represented by Rev. Join Inoue, Nichirenshu Temple; Rev. Nobuko Miyoshi, West Covina Higashi Honganji Buddhist Temple; Rev. Peter Hata, Higashi Honganji Buddhist Temple; Rev. William Briones and Rev. Kazuaki Nakata, Los Angeles Hompa Hongwanji Buddhist Temple; Rev. Shumyo Kojima, head priest, and Rev. Daiki Toho, Zenshuji Soto Mission Temple; Rev. Ryuzen Hayashi and Rev. Daichi Kihara, Koyasan Buddhist Temple; and Rev. Mark Nakagawa, Centenary United Methodist Church. A Japanese traditional music tribute was performed by Yukiyo Shelley Ikebe of Los Angeles Todo-Kai (koto), Ken Glaser (guitar) and Greg Matsuura (shakuhachi). 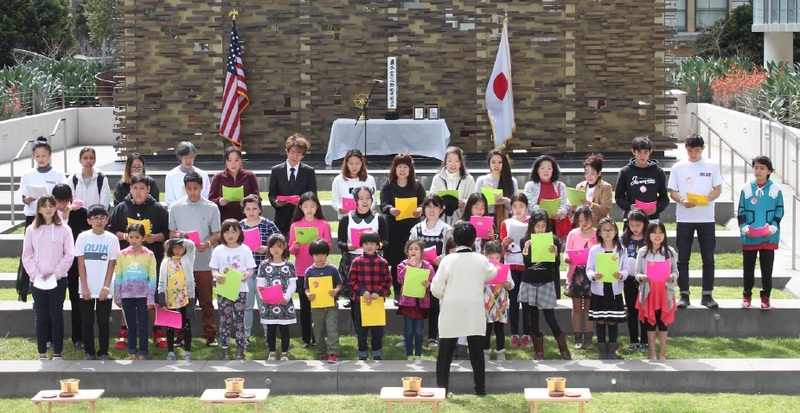 Students of the Japanese Language School Unified System, conducted by Takako Osumi, sang “Hana wa Saku” (Flowers Will Bloom), a song written to support the reconstruction effort, and “Te no Hira o Taiyou ni” (Hands in the Sun). Fire Chief Daryl L. Osby gave a presentation on natural disaster preparedness. One tip was to decide on a meeting point for family members who are separated by a disaster. Masako Unoura-Tanaka, founder of the Love to Nippon Project and a 3/11 survivor, Osby with a letter from Mayor Kimiaki Toda of the Ofunato City, Iwate Prefecture. It was an official invitation to the Los Angeles County firefighters to visit Ofunato in 2020. In August 2018, Osby, assisted by Fire Captain Glenn A. Wright, met with a delegation from Ofunato City, including Toda, as well as representatives from the Love to Nippon Project. It was the mayor’s second official visit to thank the people of Los Angeles for their support of the Tohoku region since 2011. Toda explained a program initiated by the Japanese government to recognize and thank citizens of the U.S. for their support and to share news on the status of the reconstruction. 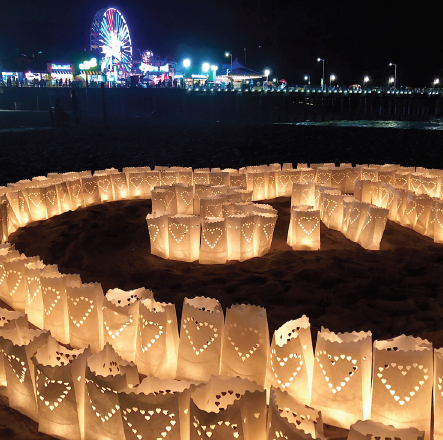 Lanterns illuminate the beach near Santa Monica Pier in a show of support of those still recovering from the 3/11 disasters. The program, called “Fukkou Arigato,” is timed to coincide with the 2020 Paralympic Games, which will be hosted by Japan. Toda noted that two U.S. Urban Search and Rescue Teams, from Los Angeles County and Fairfax County in Virginia, came to Ofunato within 48 hours of the tsunami. He also discussed a ceremony held to receive and plant 3,000 dogwood trees that the U.S. presented to Japan for the rebuilding. Ofunato received 60 of those trees. Representatives from the U.S. Embassy and U.S. Navy participated in the ceremony. Toda mentioned several exchanges as part of Fukkou Arigato, including a second exchange between the Fairfax County Urban Search and Rescue Team in March 2018. The Los Angeles County team was also invited, but could not due to the massive wildfires in California. Osby thanked Toda for the invitation and committed his team to visit Ofunato in 2020, most likely after the Paralympics. He said that his team will commence working on the arrangements for the visit in coordination with Toda’s office and Unoura-Tanaka. Osby remarked that he is interested in gaining a better understanding of the “lessons learned” while visiting Ofunato to enhance L.A. County’s own operations. One measure that he would like to see implmented is an early warning system like the one used in Japan. Deputy Consul General Hiroki Matsuo gave words of appreciation and closing remarks were made by Unoura-Tanaka and Doug Erber, president of Japan America Society of Southern California.